Despite world leaders reaching an agreement on climate change after two weeks of negotiations in Paris, environment campaigners have issued statements saying they remain unconvinced. Ministers from 196 countries reached a deal to attempt to limit the rise in global temperatures to less than 2C, at the COP21 climate change summit on Saturday. 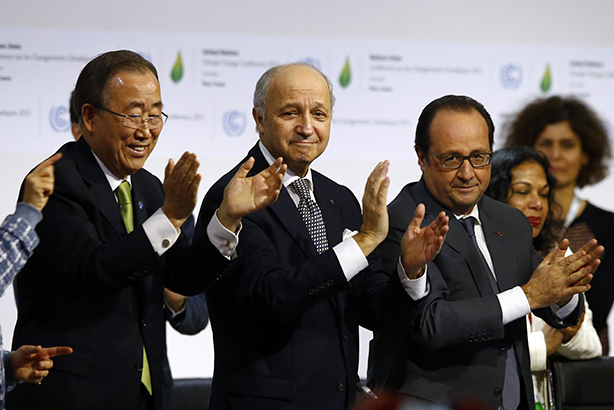 It is the first climate deal to commit all countries to cut carbon emissions. Some aspects of the deal will be legally binding, but others will be voluntary. President Obama said the deal could be a "turning point for the world". David Cameron said it could be a "huge step forward in securing the future of the planet". However, some environment campaigners are less convinced. Friends of the Earth CEO Craig Bennett issued a statement saying that although the deal marked a "historic moment" it "falls far short of the soaring rhetoric from world leaders less than two weeks ago". He continued: "An ambition to keep global temperature rises below 1.5 degrees is all very well, but we still don’t have an adequate global plan to make this a reality. This agreement leaves millions of people across the world under threat from climate-related floods, droughts and super-storms." Bennett called on the UK Prime Minister to "end Britain’s scandalous support for fossil fuels including fracking", and said that "people power" had finally succeeded in making governments take the issue of climate change seriously. Greenpeace International said the deal marked "progress" but there was still a long way to go. Nick Turton, head of energy at business comms consultancy Madano, and former head of media at the UK Government's Department of Energy & Climate Change, is optimistic. He told PRWeek: "The French have played a blinder. This has been two decades in the making and to get a deal with all countries on board is unprecedented. "The litmus test is is going to be seeing national commitments survive the real world outside the negotiating room – of government changes, economic cycles and vested interests over the coming decades. "But my glass is half full. With the US and China already pursuing domestic policies unthinkable only a few years ago and boardrooms – even big oil – backing action, this time it feels like the UN process is catching up with what's actually happening on the ground."